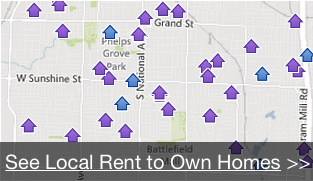 How can I find rent-to-own homes in Colorado Springs? To see available local rent to own and lease purchase homes enter your info below to get started! "I would recommend you to anybody considering a real estate transaction, particularly one that seems impossible to execute..."
I want to sincerely thank you for evaluating my property. You were honest and forthright regarding all my options. I cannot tell you how much that meant to me. You explained matters in a fashion that was upfront and direct. I felt completely confident and comfortable working with you. I would recommend you to anybody considering a real estate transaction, particularly one that seems impossible to execute because of the market or because of time constraints. Folks like you truly are interested in win-win solutions, and in an industry that can be cutthroat, that approach means everything. "They not only helped me face my problem, they helped me move on." I would definitely recommend Maverick Homes to anyone having a problem with their real estate. I was in foreclosure for years, but my note kept getting sold to one mortgage company after another and none of them completed the foreclosure. Howard and Betsy had nothing to gain by helping me, but they took the time to dig into my situation and give me the information I needed to make a decision. They not only helped me face my problem, they helped me move on. Soon it will all be behind me and I won’t have that dark cloud hanging over me forever. "The sale was extremely simple and was definitely stress-free... doing most of the sale from another state." Thank you for everything. The sale was extremely simple and was definitely stress-free. You guys were quick and easy to work with and I really appreciated how much you kept me updated on the status of each step of the sale. Everything was much easier and smoother than I expected it to be with me doing most of the sale from another state. I was extremely excited to complete the sale so quickly. Thank you again, Betsy. It was a pleasure. "With rent to owns, you can lock in the sales price and terms upfront, allowing you to purchase the house at a below-market price in a few years"
"She worked out a deal that was well within our means to achieve." We would recommend Maverick Homes to anyone who is in danger of foreclosure! We were in foreclosure and we did at first work out a deal with our mortgage company to pay a certain amount of money within a certain amount of time. Well… things didn’t go quite as planned. We were late on a payment and the bank demanded a huge lump sum payment that we did not have. We got in contact with Betsy from Maverick Homes, explained to her the situation and she became the liaison between the mortgage company and us. She worked out a deal that was well within our means to achieve. Maverick Homes was a Godsend for us. Thank you so much for helping us. LEGAL DISCLAIMER: Rent To Own refers to properties for sale with lease-option financing. This site does not charge for rental listings and is not a Pre Paid listing Service as defined by California Business and Professions Code 10167. Terms of credit during rental period dependent on agreement with homeowner. Terms of credit may affect ability to qualify for home loan at end of lease period.